Now, since I am very familiar with the savvy, witty and often times hilarious content that Taco Bell dices up on a regular basis, I clicked the link. In summation of the article, a high school swimmer from Illinois wrote to Taco Bell explaining his swimming successes while admitting that he visits that fast-food megalith at least 5-7 times a week. He then went on to say that it would mean the world to him if the company would send him customized speedos that said “Think Outside the Buns” on the back. 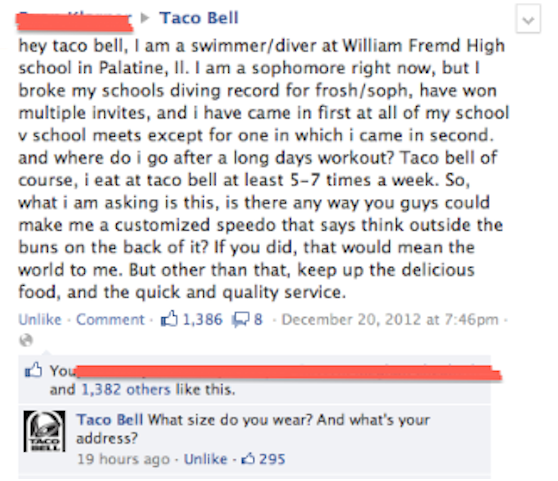 Instead of writing this off as a silly comment, Taco Bell responded asking him what size speedo he wears, and where they should ship the customized swim gear to. The article got me thinking about all the times my cousin and I sat around the living room as teenagers, scratching our heads as to how we could get Nike to endorse the new logo that we had been working on, or all the times we spent coming up with catch phrases for sports teams in hopes they would recognize our intellectual prowess and would offer us dream jobs in their departments. Since social media was irrelevant in those days, we were forced to shelve our ideas, forced to chalk them up as childish inclinations made on breezy summer days. But here is a story of a kid who did what my cousin and I could not- that being to get the attention of a major corporation- by posting a simple, honest comment on Reddit. 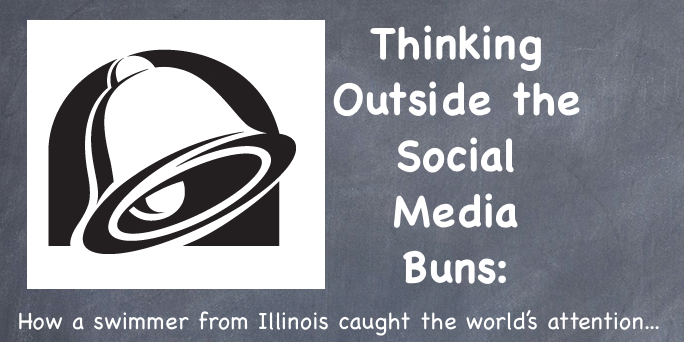 Despite the grammar mistakes in his post, his sincerity and youthfulness captured Taco Bell’s attention, to the point where they rewarded him for his honest creativity and innovative thought. This example showcases the opportunities that social media presents. Here is a kid who hitherto had been so far off Taco Bell’s radar that he could have been considered a sauce packet found in one of their stores. But he made one comment, probably seen by a social media intern at Taco Bell and relayed to upper management until it found its way on the desktop of a corporate big whig, and next thing he knew, he was on their radar, like a massive blimp in the aerial clouds. Point is, so many businesses are quick to write-off social media as jibber-jabber unworthy of a place on the budget reports of corporate America; they perceive social media as a place filled with inaudible voices that lack coherency and fervor. But truth be told, the power of the human voice has grown inexplicably since the advent of social media, like the common man has finally been given an international boom-box for the communicable world to hear. And guess what? The brands and companies who understand social media and are doing it right hear these voices, respond to them and create gateways of engagement that can lead to opportunities, global recognition, and speedos that have “Think Outside the Buns” printed on the back. So if you are sitting in your desk wondering how best to interact with your consumer base, think about Taco Bell, think about the high-school swimmer from Illinois and ask yourself which is better: having a desert of a presence on social media, or engaging with the thought-provoking, creative, intuitive and unfiltered thought processes of social media users who, above all, just want to be heard by the companies they hold in the highest esteem. Social media is always waiting with open arms. If the request is as unique, sincere and authentic as that, then it’s an eye catcher. It’s nice to know that the bigwigs are still caring for the smallest of their customers who are making them rich. Agreed…nice to know even the smallest of voices can be heard amongst the corporate clamor.